Tailor it yourself to your specific needs with a range of various refillable pages. 4x6 Pockets Landscape White style Large page inserts designed to fit our Large size Life Arts post bound album range, giving your album extra versatility. Each pack contains 10 sheets / 20 sides of plastic sleeve pockets; each side fits three landscape 4''x6'' (10cm x15cm) photos giving a total of 60 photos per pack. Our post bound albums come with 30 pages of inserts as standard, in which ever style you choose. This extra set of 10 pages gives you that extra versatility and freedom to extend your album space for future pictures. This professional system is not only for photo albums: it also can be used for portfolios, presentation work or restaurant menus as it easy to put in, take out or refill the pages. Made specially to fit Life Arts Post Bound albums. 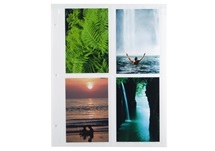 Each pack contains 10 sheets / 20 sides of plastic sleeve pockets; each side fits three landscape 4''x6'' (10cm x15cm) photos giving a total of 60 photos per pack. The photo pocket is attractive, clear, practical and very easy to use.